"I am sorry to say that there is neither stone nor statue, or indeed a memorial of any kind, erected to his memory, although I should have rejoiced, along with several others interested in Savings Banks, to see in the capital city a memorial to such a great and good man." Himself an enthusiast on the subject of thrift, Mr Cargill has spared neither pains nor trouble in connection with the Centenary of Scottish Savings Banks, to be celebrated in Edinburgh this year. Dumfries, the county of Dr Duncan's adoption, is rich in memorials of him. In the town the Savings Bank itself is dedicated to his memory, and his statue is in front, holding a scroll. This important building, as it now is, was once represented by a single room in Chapel Street, Dumfrie; "the counter or telling table consisted of two planks placed over a couple of barrels, lighted by dip candles." In his own parish an obelisk marks the scene of his many labours. The beautiful Runic cross he rescued from destruction stands in the parish church. Throughout his long and fruitful life, Dr Duncan laboured to make the people thrifty and independent. His great conception, the creation of Savings Banks, has proved a national blessing. He wished for no recognition; he asked for no recompense. His text was, "I must work the works of Him that sent me while it is day; the night cometh when no man can work." Birth—Education—Ordination—Marriage—Ruthwell Volunteers—Visit of the "Society of Friends". Poor Laws—First Literary Efforts—Publication of the "Dumfries Courier". Savings Banks founded—Visit to London—Savings Bank Bill. Home Life—Visitors to Ruthwell Manse. Correspondence with Brougham—Emancipation of Slaves—Catholic Emancipation —Geological Discovery—Runic Cross. Death of Mrs Duncan—Letters from Joanna Baillie—"The Sacred Philosophy of the Seasons"—Poem on Curling. 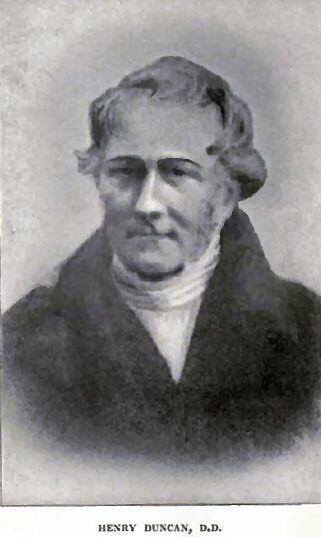 Second Marriage—Further Correspondence with Brougham—Church Patronage— Disruption of the Church of Scotland.